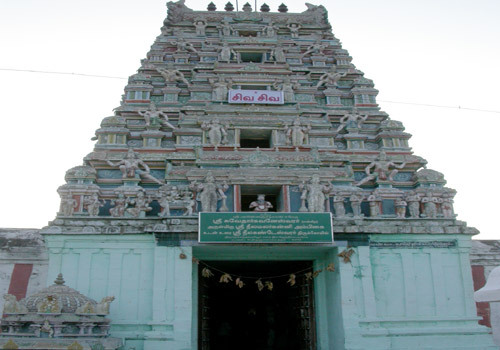 The lord of the temple is praised in the Thevaram hymns of Gananasambandar, Navukkarasar and Sundarar.This is the fourth temple praised in Thevaram hymns in Nadunaadu region. 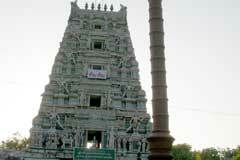 Maha Shivrathri in March-April is the festival celebrated in the temple. The rays of Sun fall on the Lord from March 16 to 20. 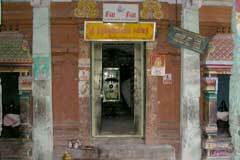 This is the birth place of Thiruneelakanda Nayanar one of the celebrated 63 Nayanars. 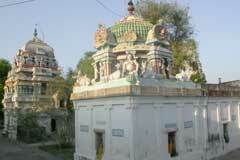 Sri Thirukumaraswami Temple, Erukathampuliyur, Rajendra Pattinam-608 703, Cuddalore district. Knowing the reputation of this sacred place, sages and Devas in the celestial world thronged this place in the form of birds and trees. Hunters of the place tried to hunt the birds and axe the trees. They heard a voice directing them to become Erukku trees not useful to any body so that there would be no danger to them. Thus, the place came to be known as Erukathampuliyur. Lord is praised as Thirukumaraswami, Swedhargavaneswarar and Ambica as Veera Mulai Amman and Abhinnakusanayaki. Those suffering from stammering and those seeking child boon pray in the temple. Devotees perform abishek to Lord and Ambica and offer vastras. 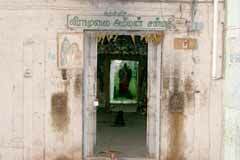 King Rajaraja Cholan prayed to Lord of this temple seeking child boon and was blessed with a son who later grew famous as Rajendra Cholan, hence, the place is called Rajendra Pattinam. Another king, Suvedhan a, staunch Shiva devotee was infected with leprosy due to his past sins and got relieved of the cruel disease by worshipping the Lord after a dip in the sacred Erukathampuliyur spring. Erukku plant has the power of curing leprosy. The rays of Sun fall on the Lord from March 16 to 20. This is a temple where those, despite all efficiencies, suffer from dumbness or stammering pray for relief. 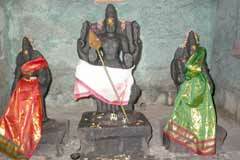 Lord Shiva was teaching the meaning of Vedas and Agamas to Mother Parvathi in Kailash. 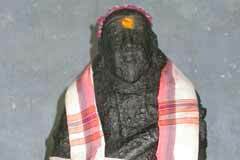 As She did not listen attentively, Lord cursed Her to be born in Bharathava community on Earth. Lord Muruga grew angry with Shiva for punishing Mother, threw the Vedas in the sea and was cursed by Lord to be born dumb in traders community. 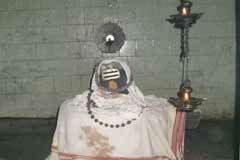 Muruga was born to Thalapathy and Gunasalini in the name of Rudrasanman in Madurai but was dumb by birth. When he grew old, he went to many Shiva shrines seeking relief and was blessed with speaking skills at Erukathampuliyur. 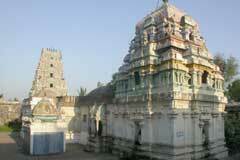 As Kumaran (Murugan) worshipped Lord Shiva in the place, the Lord is named Thiru Kumara Swami. 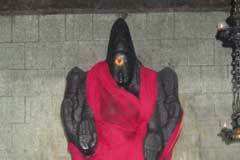 There is an idol of Rudrasanma in the temple. Miracle Based: The rays of Sun fall on the Lord from March 16 to 20. Rajendra Pattinam is 12 km far from Vruddhachalam on Jayamkondom road.